So when the doc said it would take "six to eight" weeks for my wrist sprain to heal, I chalked that up to him being a pessimist. 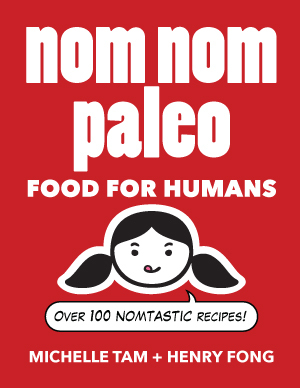 Despite having zero medical knowledge or training, I was confident that I'd recover much more quickly. (See? I'm all about positive thinking!) It'll take four weeks tops, I told myself. It's been over four weeks since my sprain (though it feels like four months), and I still can't put pressure or weight on my flexed wrist. 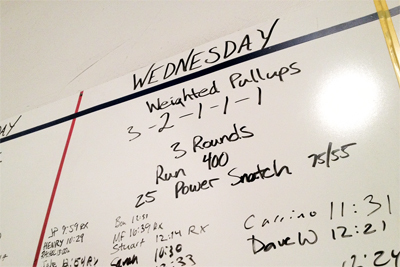 Olympic lifts, push-ups, handstands, wall balls are all still on my no-go list. Consequently, I've had to modify most all of the gym's programmed workouts to accommodate my stupid, stupid wrist. No snatches for me. I did kettlebell cleans and presses instead. Result: 10:29. 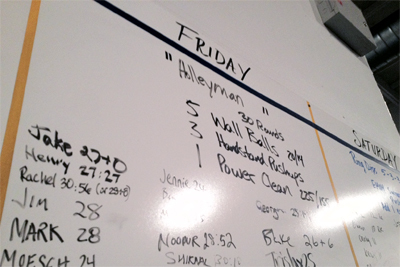 "Holleyman" looked like a fun one (well, except the wall balls). But I wasn't able to do any of the movements in this workout. I subbed out dumbbell thrusters for the wall balls, ring rows for the HSPUs, and a 70-pound kettlebell clean for the power clean. Result: 27:27. 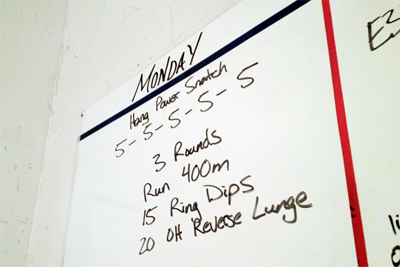 On Monday, I attempted this run / ring dip / overhead reverse lunge workout as RXed, but after the first round, my wrist was aching. For the final two-thirds of the workout, I did ring rows (again) in place of the ring dips, and for the reverse lunges, I held a light kettlebell up overhead instead of a barbell. Result: 12:13. But is it really going to take another two to four weeks for my wrist to heal? Really? Because I'm going to be totally insufferable until then.